Why are Palestinians demonstrating in the Gaza Strip? The Palestinian Center for Human Rights (PCHR): On Friday 30 March 2018, the commemoration of Land Day, Palestinians launched a massive wave of peaceful weekly demonstrations known as the Great Return March along the security fence separating Gaza from Israel. The demonstrations call for the right of Palestinian refugees to return to their homes lost in the 1967, as enshrined in United Nations Resolution 194, and the lifting of the blockade imposed on Gaza Strip by Israel for over a decade. The demonstrations, which were initially planned to be held for six weeks, have continued every Friday since then (51 weeks). All segments of society have participated in the demonstrations including youth, children, women, people with disabilities and elderlies. The Great Return March demonstrations are seen by many Palestinians in the Gaza Strip as a way to vent their continued depravation with the worsening humanitarian and economic situation caused mainly by the 12-year-long suffocating Israeli blockade of the Gaza Strip. The blockade, which severely restricted freedom of people and goods, has devastated Gaza’s economy, caused widespread destruction and separated its citizens from the rest of the world. Today, the Strip is suffering from widespread poverty, high unemployment to lack of opportunities, especially among the youth, and collapsing public services such as health care, water, and sanitation. The United Nations has warned that Gaza would become “unlivable” by 2020. Where do the demonstrations take place? Since the start of the Great March of Return, demonstrations have been taking place in five designated areas located along the Gaza/ Israel border, where tents had been set up between 700-1000 meters from the separation fence. The 5 sites are: Abu Safiya area (northeast of Jabalia) , Malakah area (east of Gaza city), Al Bureij Camp (middle of Gaza Strip), Al-Najar area (east of Khuza’a in Khan Younis) and Al Shoka area (East of Rafah). Beginning in August, weekly demonstrations were also organized at the Zikim beach area in Northern Gaza Strip. Are the demonstrations civilian and peaceful in nature? The organizers of the “Great March of Return” have repeatedly stressed that the demonstrations are intended to be “fully peaceful from beginning to end” and demonstrators would be unarmed. PCHR’ investigations found that the demonstrations throughout the year were civilian in nature. Different groups of society of different ages and affiliations have participated in the demonstrations including children, women and elderlies. The demonstrations included cultural and folkloric activities and sometimes burning tires and young men throwing stones, which did not pose any danger to the Israeli soldiers. PCHR has not documented any armed manifestations in any of the five designated areas since the start of the demonstration. 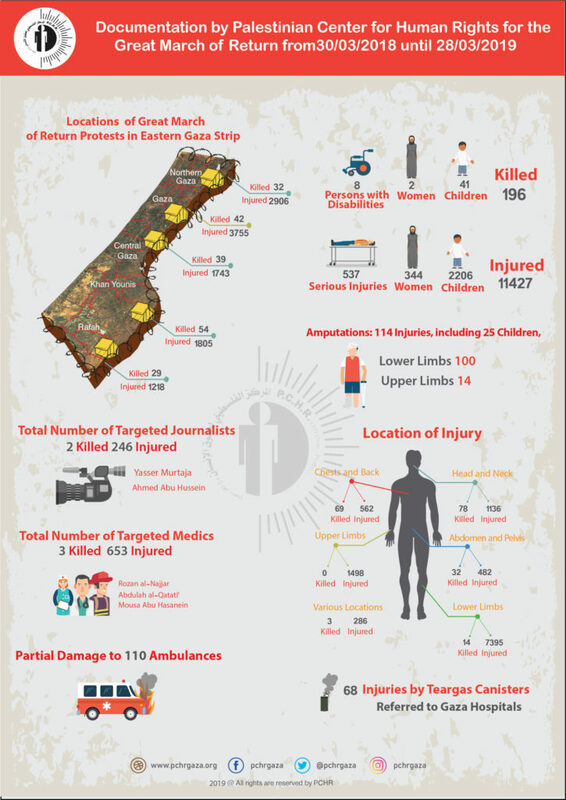 According to the report of the UN Commission of Inquiry into Gaza Protests (COI), the demonstrations “were civilian in nature, had clearly stated political aims and, despite some acts of significant violence, did not constitute combat or a military campaign.” The COI noted that with the exception of two incidents, one incident in North Gaza on 14 May 2018 that may have amount to direct participation in hostilities and one incident in Central Gaza on 12 October 2018 which might have constituted an imminent threat to life or serious injury, the demonstrators were not posing an imminent threat to the lives of the Israeli occupation forces (IOF). What is the Israeli position vis-à-vis Great Return March demonstrations? Israel claims that the demonstrations are by no means spontaneous and peaceful but rather violent public disturbances orchestrated by Hamas and other militants groups in Gaza Strip. They argue that Hamas are trying to use demonstrations riots as a disguise to penetrate the security fence and insert terrorists into its territory. The participants were collectively described by former Defense Minister Avigdor Lieberman as “Hamas members” and “operatives of its military wing”, who pose a threat to the lives and bodily integrity of members of the IOF and Israeli civilians. Prior to the start of the demonstrations, Israel decided to deploy 100 snipers along the Gaza security fence and orders were given to open-fire at anyone attempting to breach the fence. What is the legal framework applicable to the demonstrations under international law? Due to the civilian nature of the demonstrations, international law requires IOF policing the Gaza demonstrations to use lethal force only in response to a clear and immediate danger to life, when there is no other way to avert the danger. An imminent or immediate threat’, according to the COI, should be understood to mean a matter of seconds, not hours. .Moreover, in the event that resort to force is necessary, that law-enforcement officials are required to “minimize damage and injury, and respect and preserve human life”. Nevertheless, the IOF have been using live ammunition against demonstration when less lethal alternatives remained available and substantial defenses were in place, in violation of their right to life, as noted by the COI’s report. The Israeli governments, however, contends that the demonstrations can’t be classified as civilian and considers the demonstration as part of the ongoing armed conflict between Israel and Hamas. In responding to a petition presented to the Israeli High Court of Justice (HCJ) against the IOF rules of engagement, Israel provided an unprecedented legal thesis by arguing that a law enforcement paradigm can exist within the framework of the law of armed conflict along with the conduct of hostilities paradigm. In other words, a different law enforcement paradigm that is rooted in the law of armed conflict governs the army’s use of force against Gaza protestors. However, the consequences of this purported divergence is dangerous as it allows for a wider use of force against civilian demonstrators. According to the state of Israel, under this paradigm, lethal force can be used against a person who does not pose a threat personally but part of a crowed that does. The second dangerous consequence is that lethal force can be used against a threat before it materializes and becomes immediate. Unfortunately, the HCJ accepted the legal claims put forward by the state, and invented an obscure new law enforcement paradigm expanding the notion of imminent threat to allow for a preventive use of lethal force. By reaching this judgment, the court legitimized the excessive use of lethal force by the IOF on Palestinian demonstrators, which so far has resulted in the killing of 196 civilians and injuring more than 11,000, according to PCHR’s documentation. What are the most prominent violations committed by the IOF against Palestinian demonstrators in the context of the Great March of Return? The IOF have committed serious violations of international human rights law and international humanitarian law in the context of the March of Return demonstrations. The targeting of civilian demonstrators is a violation of the Palestinian’s right to life, freedom of expression and assembly. The IOF continue to deliberately violate UN Basic Principles on the Use of Force and Firearms by Law Enforcement Officials which forbid the use of lethal use of firearms unless “strictly unavoidable to protect life”, as stated above. There were almost no incidents since the start of the Great March of Return which warranted the use of lethal force against peaceful protestors exercising their right to peaceful assembly. Despite this, the IOF have killed 196 civilians including, 41 children, 8 people with disabilities, 2 women, 2 journalists and 4 paramedics during 51 weeks, which may amount to wilful killing, a grave breach of the Geneva Conventions and a war crime. In addition, the devastating toll on civilian lives in Gaza should not only be measured by the number of Palestinians killed but also the number of injuries. The IOF have been using shooting demonstrators with high-velocity weapons fired from a close range, which caused extreme bone and tissue damage as well as large exit wounds which resulted in long-term, life changing injuries, including paralysis and amputations. Since the start of the demonstrations, 114 Palestinian demonstrators have had their lower or upper limbs amputated including 14 children. This suggests that the IOF are deliberately intending to inflict life-changing injuries, which amounts to willfully causing great suffering or serious injury to body or health, a war crime as well. Did Israel conduct any criminal investigations into the violations committed? The Fact-Finding Assessment Mechanism (the FFA Mechanism), headed by a Major General, was ordered on 4 April 2018, by the then IDF Chief of Staff, to examine exceptional incidents allegedly occurring during the Gaza border events and provide the findings and materials to the Military Advocate General (MAG) for his review. According to the Israeli army, where the finding and materials of the examination give rise to a reasonable suspicion of criminal misconduct, the MAG will order a criminal investigation. Criminal investigations ordered by the MAG are then conducted by the Independent Military Police Criminal Investigative Division, more specifically, the Military Police Criminal Investigative Unit for Operational Affairs (CIUO). According to the COI’s report, criminal investigations were opened in only five cases, including the deaths of four children. More recently, Israeli officials stated that Israel is currently conducting criminal investigations into the killing of 11 Palestinians at border demonstrations in Gaza last year. Israel has systematically failed to conduct serious investigations, especially in view of the fact that many violations of international law committed during the Israeli offensives on the Gaza Strip are a direct result of the policies adopted by the highest political and military leaders that has publicly pledged in many statements not to prosecute any of their soldiers on alleged crimes against the Palestinians. Can the victims or their relatives resort to Israeli courts to claim compensation? Accordingly, this legislation deprives the victims of their fundamental right to have a judicial remedy, including compensation that is essential for victims to rebuild their lives partially. 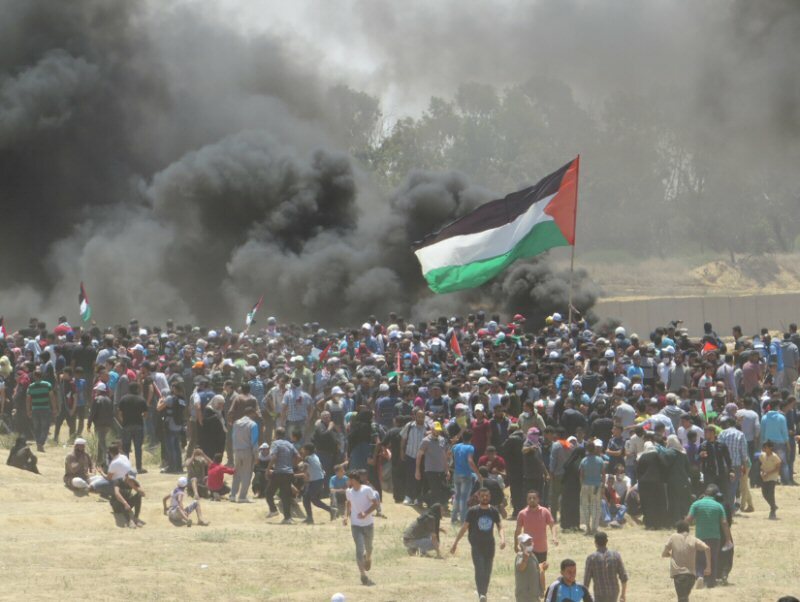 How did the international community respond to the Great March of Return demonstrations? On 18 May 2018, a UN Commission of Inquiry (COI) was established, pursuant to Human rights Council (HRC) resolution S-28/1 to investigate violations and suspected international crimes committed during the Great Return March. The COI presented its finding and recommendations to the HRC during its 40th session and were adopted by the HRC on Friday 22 March 2019 . The COI found reasonable grounds to believe that IOF committed serious violations of human rights and international humanitarian law and that some of those violations may constitute war crimes or crimes against humanity and must be immediately investigated by Israel. The Commission called on Israel to refrain from using lethal force against civilians and ensure that all those injured at the demonstrations are permitted to access to healthcare abroad. It also called on Israel to lift the blockade on Gaza which is the source of many international humanitarian law and human rights law violations. The March of Return demonstrations are still continuing. There are serious concerns that the Israeli occupations forces will once again resort to the excessive and unlawful use of lethal force to suppress Palestinian demonstrators on 30 March 2019, when Palestinians commemorate the first anniversary of the Great March of Return . In light of this, Israel must refrain from using lethal force against civilians who pose no imminent threat and changes it rules of engagement in accordance with international humanitarian rights law given the civilian nature of the demonstrations. It must also address the Great March of Return from its root causes by lifting the 12-year illegal and inhumane blockade, which amounts to collective punishment and has made Gaza uninhabitable place, as well as realizing the right of Palestinian refugees to return to their homes and property, as mandated by international law. PCHR, “Israeli Courts Insist on Decisions Depriving Palestinian Victims of Access to Justice and Judicial Remedy and Making It Impossible”, 12 January 2012.